I’m having fun writing a weekly menu and we generally stick to the plan. I admit I may be a bit ambitious when writing it. I also don’t think it helps to write a meal plan on an empty stomach! I came home with a few yummy things from The Food Show including 2kg of Southland Queen Scallops and 4 kinds of cheese! Still, this week, our pantry reserves are getting low and we haven’t been to the supermarket in a while so we’ll have to pick up a few things. …and a loaf of ciabatta. We love scallops Genie. I am not really sure what a cottage pie is. To me, a Cottage Pie is a Shepherd’s pie using beef instead of lamb. But I believe that these days Shepherd’s Pie may also refer to beef pies and Cottage Pies may also refer to lamb pies. Yummy 🙂 I LOVE cottage pies. And making them into individual servings makes it easier to control cravings. Great idea! Is there a recipe I can reference? I would love to try them. I know what you mean about over eating on cottage pie. I usually make enough for a family even though there is only 2 of us and we’ll have seconds and maybe even thirds. No one needs that much pie. Want is a different matter. To be honest, I just eyeball it and taste as I go. Basic recipe: In a hot pan brown enough beef mince for 2 people in 2 tablespoons of olive oil. Add 2 sliced mushrooms, 1 grated carrot and 2 cloves of garlic, diced onion optional (we ran out of onions). Add a dollop of tomato paste, a tablespoon of flour and a measure of soy sauce and of worcestershire sauce. Taste and season to your preference. Cook down until it looks and tastes right. Transfer into 2 large ramekins. Add a handful of thawed peas, a layer of mashed potato and top with grated cheese. Bake in a hot oven until you cannot bear waiting any longer. yum! thanks for sharing 🙂 Can’t wait to enjoy it! Looks great! 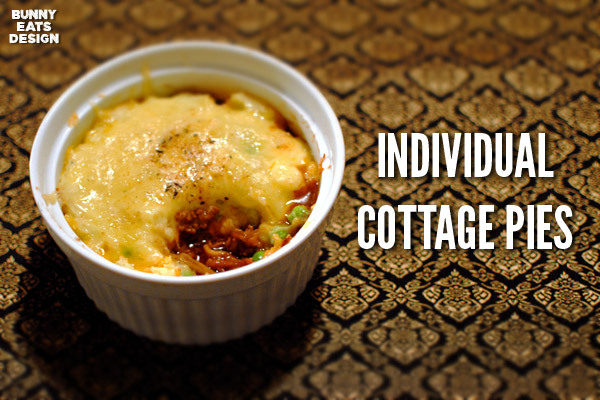 I usually make one big cottage pie, but I love the idea of individual ones. I have this idea that it helps with portion control . . . but then again, I usually have 2-3 individual anything . . . !